Fitting nicely with the laid-back and eclectic vibe that typically dominates the Sunday programming at the festival, the New York-based artist formerly known as Zeb, now Spy from Cairo, wove together a very intricate, organic sounding performance that prominently featured his live oud playing that he layered on his deep, dubby beats. 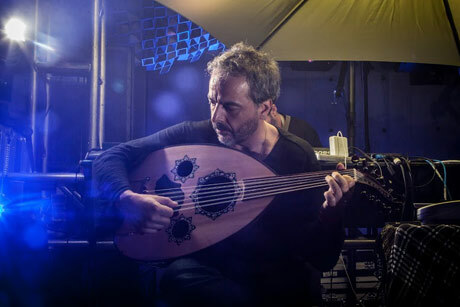 Tracks like "Haboob" and "Sons of Hannibal" really showcased Moreno Visini's oud skills, seamlessly meshing his live instrumentation with his programmed beats and bottom-heavy bass. His meditative melodies, world-beat influenced flair and ephemeral textures drifted across Old Market Square and added a certain vibe that hadn't really been explored at the Cube during the festival. With a far-reaching sound palette that incorporates rhythms, instruments and melodies from Turkish, Middle Eastern and Persian traditions, Spy from Cairo was one of the most unique and satisfying acts on the final day of the festival.